Bees (Apoidea superfamily) are flying insects, closely related to wasps and ants. They are adapted for feeding on nectar, and play an important role in pollinating flowering plants, and are called pollinators. 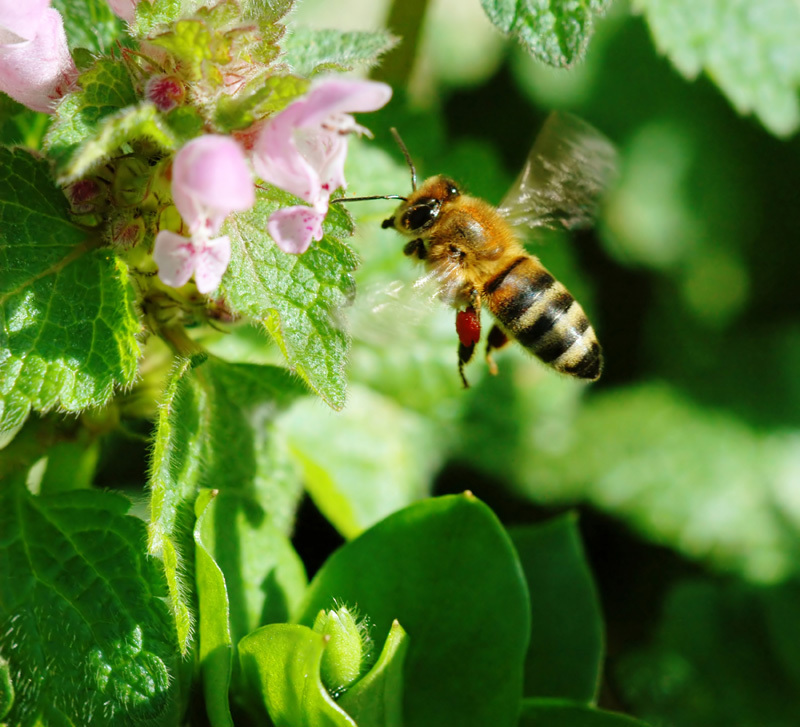 Bees have a long tongue that they use in order to obtain the nectar from flowers. Bees have antennae made up of thirteen segments in males and twelve in females. They have two pairs of wings, the back pair being the smaller of the two. Their legs are modified so that they can gather pollen and the apex of their abdomens are modified into a stinger.You see the red thing on the leg? Interesting thing about bee�s is their mouth anatomy.It is complex. The mandibles (jaws) are suspended from the head at the sides of the mouth. They are used in handling objects, manipulating pollen and in contact with other bees.Their communication system is also very interesting.But I�ll write it in an another bee shot! The front of the mouth is composed of a wide plate or labrum. A proboscis is formed by bringing together several lower mouth parts. The two maxillae and the median labium (a movable flap) form the proboscis which is the tube used for feeding on nectar. Yes, flying insects. I know how hard is take good picture of one of them. But you did it very good. Colorfull, sunny and with sharp bee. I like it! g�z�m doğrudan arıya kilitlendiğinden alttaki boşluk biraz fazla geldi ama yine de siz bana bakmayın, kıskan�lıktan �amur atıyorum. Hi Sebnem good shot of the bee. They aren't the easiest to catch. Well done. I write you one more time - I love summer on your pictures! Great flying bee shot Sebnem, great colour and nice detail of the bee. I had try many shots of bee, so far, I haven't success yet. Well done! İkincidir yazıyorum yazdıklarım yok.�ok başarılı bir aksiyon Tebrikler..
Wow, you manged to shoot a flying bee (or is it a wasp?). Well done! TFS! Good capture, I would crop the bottom cause it's not very useful. two thumbs up for your patience....the moment is great. Very nice shot Sebnem, the composition and sharpness are great, although cropping some off the bottom is a good idea. Lovely details. Well done. Sebnem, I do know how difficult it is to shoot these kinds of shots. You did great here. Beautiful colors in this great moment. The workshop is better in my opinion. Colors are vivid and nice. I think,you should crop the lower part! Sorry Sebnem, I have no time to write a decent comment. I give to you the well deserved smily. Thank you for sharing pictures and notes and for the enjoyment which they give to me. This is a very nice and colorful bee shot. What attracted me is the fact that you captured the bee while it was flying, which is extremely difficult ! The sharpness is great and we can see the hair of the bee. The light is perfect and the exposure is very good. As you said, the cropped version in the workshop section is far better. I wonder how long you have waited to get this shot:). Very nice..
excellent position of the bee (facing flower). great Macro, excellent POV and wonderful sharp details! Une excellente photo en macro,les couleurs sont justes et parfaitements expos�es ainsi que les d�tails.. F�licitations pour la belle composition. Fotografin g�zelligini ifade edecek kelime bulmakta zorlaniyorum. Netlik, renkler, minik arinin pozisyonu, ayagindaki kirmizi kisim, yapraklarin t�yleri, hepsi birbirinden g�zel ve kusursuz fotograflanmis, tebrikler! did the "original"; & that's how the ws version came about. It is NOT EASY to shoot a high speed flying object leave alone a small, tiny bee. Excellent job. Looks 3D. Excellent notes. Very nice picture of bee and flowers. This is a moment well captured. You did well in freezing this bee in action. Light, color, pov, dof all are great. This is a joyous bright sunny day. I like your impressive in-flight picture which has presented hard-working bee ate all its beauty. I like the POV, perfect details and sharpness of the insect and nice at whole pictured scene. My best wishes and TFS.